This article was translated from Arabic to English. Read the original version here. “Today, there is no freedom, especially the freedom of religion. The Ministry of Religious Endowments will not allow unlicensed preachers to give sermons at mosques. We are the sole competent authority to decide on this matter.” This was the answer of Muhammad Abdel Razeq, former undersecretary to the minister of religious endowments for mosque affairs, in response to a question about allowing Salafist clerics to deliver sermons at mosques. This response could be a signal of the state’s approach to religious control through al-Azhar Mosque when dealing with religious freedoms in general, whether related to preaching at mosques, expressing mixed religious views within the Sunni school, or the freedom of religious practice or belief in other sects such as the Shi’a sect. Al-Azhar is dissatisfied with the expression of the mixed views arising from the Sunni school, as al-Azhar is “the main reference of religious sciences and Islamic affairs” on the basis of Article 7 of the Egyptian Constitution. Later on, we will also discuss how al-Azhar deals with Shi’ism or with other faiths such as Bahá’ísm and how the courts relied on the opinions of al-Azhar to restrict the freedoms of followers of these faiths and sects. Sisi then addressed Sheikh Ahmed al-Tayeb, Grand Imam of al-Azhar, saying, “You imams are responsible before Allah.” These words hint at the state’s view, represented by its president, of the freedom of expression in religion, where competent authorities and scholars shall assume that responsibility. Obviously, the TV show Ma’a Islam (“With Islam”), presented by the intellectual reformer Islam al-Behairy, was a prime example of this issue. Behairy criticized Islamic heritage and centuries-old interpretations. Al-Azhar scholars accused Behairy of insulting Islam. In April 2015, al-Azhar filed a complaint to the General Authority for Investment calling for a ban on the show. In this complaint, prepared by the Azhar Islamic Research Academy (AIRA), al-Azhar objected to Behairy’s repeated allegations that the religion is not a science and that sharia is understood by all people and addressed to all people. Behairy claimed in his show that everyone has the right to understand religion according to his personal views and inclinations. The complaint deemed Behairy’s statements to be a call for misleading people into misunderstanding Islamic texts and rulings. It added that all religions and laws have restrictions and Behairy is mistaken to call for the easing of restrictions in Islam. The case was closed when the TV show was suspended and Behairy was jailed for one year in December 2015 on blasphemy charges. It is noteworthy that the opinion of Gomaa, as a scholar, appears to be in line with Law No. 13 of 2012, an amendment to some provisions of Law No. 103 of 1961 on the reorganization of al-Azhar institutions. 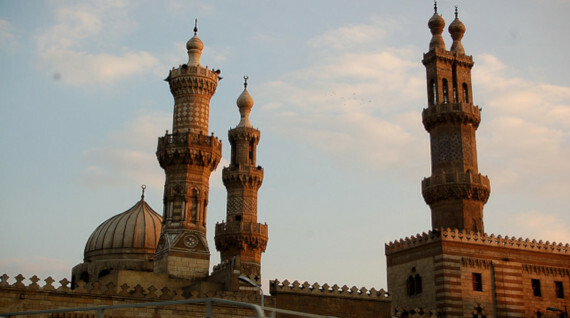 In Article 2b, the law states: “Al-Azhar is the main reference for Islamic affairs, sciences, and heritage, the interpretation of principles, and Islamic jurisprudence.” This in turn underscores an agreement between al-Azhar and the state on restricting the freedom to discuss religious opinions, particularly fatwas. The official religious institutions published papers that incite hatred and discrimination against Shi’a. For instance, Dar Akhbar al-Youm published a book titled The Shi’a Are Coming written by Said Ismail, with a forward by Tayeb. In May 2015, Tayeb condemned more than once the practice of religious rituals by Egyptian Shi’a, describing it as “Shi’a preaching in Sunni states,” in a statement to the institution’s official newspaper, Sout al-Azhar. In the same month, Tayeb, in his TV show during Ramadan, addressed several controversial issues, including the Shi’a opinion concerning Prophet Muhammad’s companions. Tayeb described Shi’a as “blasphemers” of the companions. Other testimonials of the state’s religious policy toward the Shi’a were published in a report by the Egyptian Initiative for Personal Rights (EIPR) titled Restricted Diversity in State Religion: The Case of Religious Freedom of Shi’a Egyptians. Based on the above, the role played by al-Azhar as the guardians of religious identity or the Ministry of Religious Endowments as the authority responsible for the management of religious activities is not restricted to the practice of Islam. This comes in tandem with the constitutional and legal role of al-Azhar in managing the freedom of religion and belief in Egypt. If there is a real political will to enhance the freedom of belief, this role will be revoked and a democracy favoring equality in rights and freedoms and in which no centralized religious institution plays such a powerful role will be adopted.